The <summary> element is used to defines a visible heading for the <details> element. The heading can be clicked to view or hide the details. The <summary> element is used as a summary, caption or legend for the content of a <details> element. The <summary> tag supports Global Attributes and Event Attributes. <summary> element belongs to Phrasing content or one element of Heading content. HTML 4 does not support <summary> tag. The <summary> tag is new to HTML5. <summary> tag defines the heading for <details> element. Here Wikitechy is the caption for <details> element. 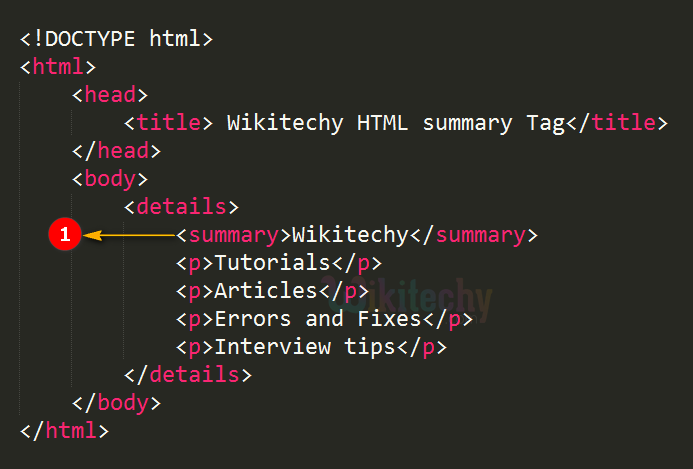 <summary> tag content “Wikitechy” displayed with a hidden details. When user click the ”Wikitechy” that will show the details. The <details> tag should have <summary> tag as its first child element.